Last week, IUP student Lake Ingle took to his Facebook page to let his disbelief be known. He is being punished, he wrote, by the university for his response after the professor of his class on "self, sin and salvation" showed a TED Talks video featuring transgender woman Paula Stone Williams. Ingle detailed his "best and fairest" account of the incident that transpired after Dr. Alison Downie showed the video to the class on Feb. 28, in a now-deleted Facebook post. "On Wednesday, February 28th, in one of my major-required courses, the instructor played a 'Ted-Talk' during which a transgender woman discussed her previous experiences of manhood as well as her current experiences of womanhood," Ingle wrote. "During her speech, she gave accounts of things such as 'mansplaining', 'male-privilege', and 'sexism' and deemed them systemic. She also alluded to the REALITY of the gender wage gap, stating women '...work twice as hard for half as much.'" After the video ended, Downie opened the floor for a discussion on "mansplaining," male privilege, sexism and the gender wage gap and allowed only women to voice their thoughts first. Ingle stated that after about 30 seconds of silence, he voiced his objection to the "use of one person's anecdotal accounts of the previously mentioned experiences as fact." 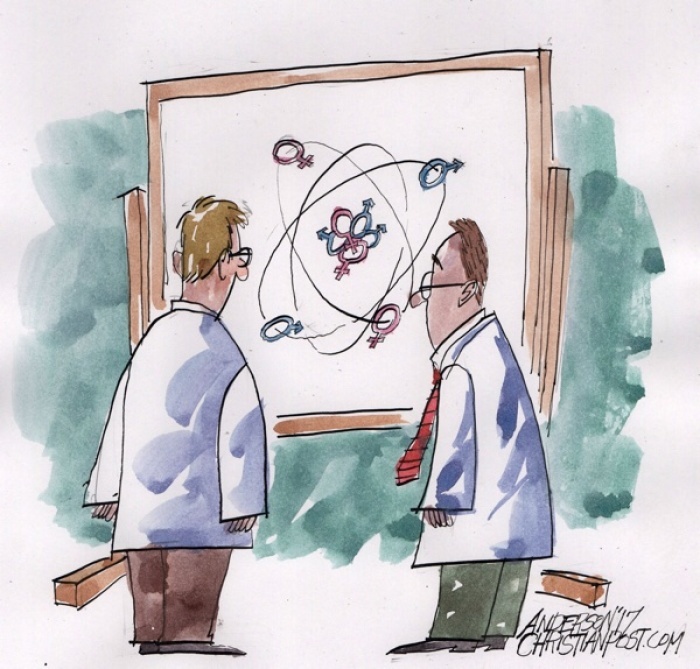 "I also took this opportunity to point out the official view of biologists who claim there are only two biological genders, as well as data from entities such as The Economist on the gender wage gap and how the claims made in the video were far from the empirically supported evidence," Ingle wrote. "I then objected to the instructor's, as well as the Religious Studies Dept. 's misuse of intellectual power, of which I have become familiar over the past few semesters." "It was at this point others in the class entered the discussion," he added. "Class proceeded normally, thereon." According to Ingle, he met with the instructor the next morning to discuss class project he is working on. During that meeting, Ingle wrote that he was presented with an "Academic Integrity Referral Form and Documented Agreement." The form alleges that Ingle had a "disrespectful objection to the professor's class discussion structure." It also accused the student of talking out of turn and of having "angry outbursts in response to being required to listen to a trans speaker discuss the reality of white male privilege and sexism." Additionally, Ingle was accused of making "disrespectful references to the validity of trans identity and experience." The form also called for him to issue an apology in front of the class on March 8 for each of the "disrespectful behaviors" described by the professor. 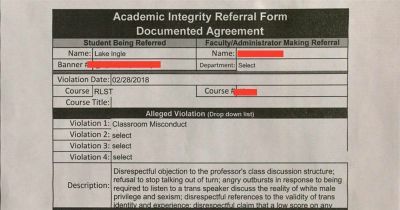 The form states that after giving his apology, Ingle would have had to "listen in silence" as students in the class share how they felt during Lake's "disruptive outbursts." Ingle denied the professor's claims in his Facebook post. "Though the documents attached present a narrative of disrespect, disruption, anger, and intolerance — I can assure you that nothing is further from the truth," Ingle said. The Christian Post reached out to IUP for clarification about Ingle's alleged "angry outbursts." However, a university spokesperson told CP that no comment could be provided because of the Family Educational Rights and Privacy Act as it pertains to student education records. Ingle wrote in his post that he received a second document that lists further details of the violation. "After these documents were handed to me, I read them carefully several times. I asked for one line to be revised and was answered with 'no' and was told it was the instructor's job to recount what took place, not mine," he wrote. "I then commented on the total misuse of intellectual power in a university setting, at which point I was asked to leave." The next morning on March 2, Ingle received a letter from Provost Timothy Moreland telling him that he is barred from attending the class and barred from speaking with Downie until the charges against him have been adjudicated. "[T]he wording in the documents below is not only exaggerated, but more than one line is entirely untruthful and is done so purposefully to discredit my views and paint me as intolerant and ignorant," Ingle said. "THE FACTS ARE: I did not object to the views of the speaker (Paula Stone). Rather, I objected to its misuse as hard evidence to support the 'reality' of phenomena that are not only a matter of opinion, but also empirically unsupported (wage gap statistics)." "It is my belief that the instructor's decision to file these sanctions is an attempt to bully me into redacting my views, making it a matter of free speech," he continued. "I will be battling the university, as well as my instructor, to ensure I am not permanently removed from the class, which would mean my inability to graduate as scheduled this May." Ingle is subject to a hearing before the school's Academic Integrity Board. The ruling from the hearing will be announced on March 19. In another Facebook post, Ingle explained that he was advised to remove the initial Facebook post detailing the situation with the school after he received legal counsel.